It’s been a year since Belo Baby has launched its products that are formulated to ensure that babies and even adults get the best skin care. It has been developed carefully by the most trusted brand. Crafted with care for the most delicate skin and most meticulous moms. I can really say that Belo Baby has changed the way I take care of my skin and my kids. 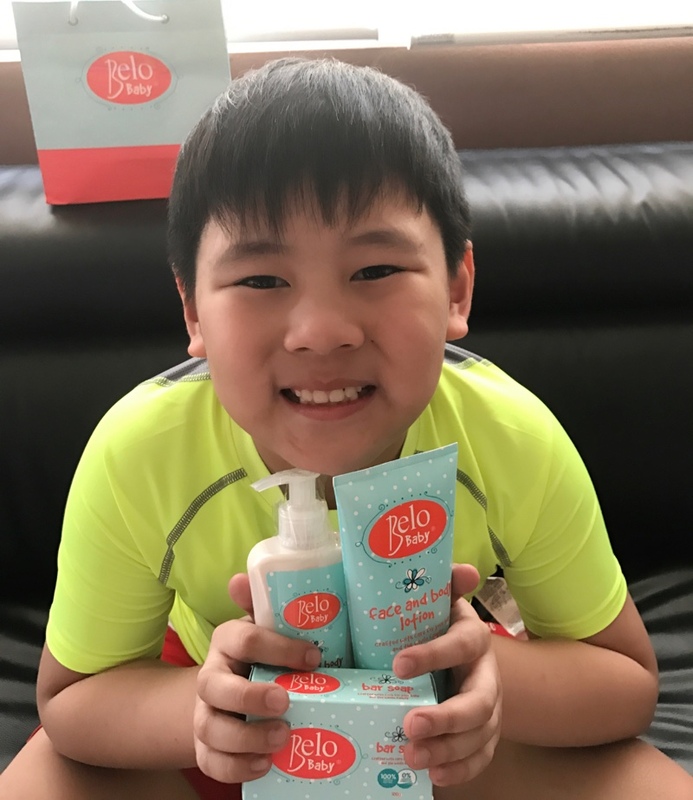 My kids still prefer using Belo Baby products until now, especially my son Elijah who has a very sensitive skin. It is very gentle on his skin that he no longer experienced dry, itchy, and rashes due to his eczema. Our baby and kids’ skin requires babying. It needs safe, all-natural care! The Belo Baby Guarantee ensures you of meticulous care with its Bath and Body products having 100% certified natural ingredients and 0% harsh chemicals. ♥ less likely to cause irritation as they are free from common allergens. ♥ generally gentler and safer than products with artificial ingredients. The core natural ingredients are cocoa butter, shea butter, and sweet almond oil, all good for baby’s delicate skin. Has antioxidant and anti-inflammatory properties; Strengthens and moisturizes skin. A know superfood for the skin; Naturally heals common skin conditions of babies like eczema and rash. A natural emollient for softening skin; Locks in moisture into the skin. It's been a year and Belo Baby has not disappointed us. The Belo Baby Hair and Body Wash and Belo Baby Bar Soap smells great and keeps my athletic boys fresh all day. Moms and children will love how Belo Baby Face and Body Lotion leaves skin soft, protected, and soothed from dryness and irritation. It strengthens skin and seals in hydration for extra protection during outdoor play. Belo Baby products is free of parabens, phthalates, SLS, and artificial color. Happy 2nd Birthday Scarlet Snow! and Happy 1st Birthday Belo Baby! Thank you for taking care of my kids’ skin and keeping them safe with your 100% natural ingredients and no harmful chemicals. 8. Share your Belo Baby moment on the comment down below with your Instagram and Facebook user name. Available in supermarkets, drugstores, online shops and even sari-sari stores nationwide. My daughter and I really loves Belo Baby Hair and Body Wash. I can easily tap bottle with no hassle and so my baby,too! It really moisturize my daughter's skin plus factor that it is also safe for her hair with no more tears on her eyes. First time I use it Ok lang for me, mabango siya, smooth at super creamy and dulas sa skin ng baby ko. But there was this time na ngka-rashes anak ko dhil sa diaper na ginamit niya, so ginamit ko lng ung Belo Baby Bath na meron ako and i discontinue muna na gamitan siya ng diaper so tiyagaan din un. After 4 days napapansin ko na mabilis ngdry ung rashes sa pwet ng anak ko and as day goes by same lng sinasabon ko sa kanya ung Belo Baby 3 times a day po.. Nabgla ako kasi nawala na ung pamula at ikatlong araw pa lang ata eh nilagyqn ko na sya ng diaper to see kung d na masakit, d na sya umiyak.. Un nga, ok na si baby, wla akong pinahid na kung anong cream para sa rashes, it was all Belo Baby Baths.. Dhil dun nagustuhan ko na siya from hair to toe un gamit ko sa anak ko! Happy 1st Birthday sainyo po Belo Baby and sana po ay continue to serve all our little angels a care and love they all deserve! I love Belo Baby so much kasi nakakatulong din po tlga ang product na madagdagan ang smoothness ng skin ng anak ko khit buong araw siyang nglalaro sa labas under the sun! It so fun to cuddle with my kids and enjoy our Belo Baby moments after their bath time. I love how Belo Baby takes care of my kids' skin. It stays healthy and moisturized all the time. Can't stop giving them some hugs and kisses! Bath time has been a fun time for my baby because of Belo Baby hair and body wash. We both love how it keeps my baby's skin clean, soft and supple. My baby also loves the mild sweet scent of Belo Baby Cologne, it keeps her free from "amoy-pawis" all day. While the hand sanitizer keeps her little hands free from germs. We haven't tried the bar and lotion yet, but I bet my baby's skin will love it too. Hoping to win so my baby Zophie can try the lotion and bar soap. I am a proud Belo Baby user!!! Every bath time fir us is indeed a happy time with this product that is made from all natural ingredients that will suits my baby's sensitive skin. An answer for a meticulous Mom like me who always wants the best for her baby!!! weather can dry out their skin and lotion can definitely hydrate it.I used face and body lotion for my baby Pray.Application was so easy it smells like the soap and body wash.It looks like light,goes on lightly on the skin and it absorbed so fast as well.That's why my Baby Pray really loved it so much.Really suit for my baby meticulous skin.I also like that Belo Baby isn't at all expensive! I love the ingredients so much it contains antioxidants qualities that can protect my baby skin from the outside.It keeps my baby skin healthy by strengthening and deeply moisturizing.I like it also because it can relieves common skin irritation rashes.I really love Belo Baby meticulously selected ingredients that are natural,safe and gentle for my baby. Belo Baby helps me bond with my baby. Since the products are crafted for my baby and the whole family, Budget-friendly, the whole family can use it and it will take care, protects and nourishes our skin. Making it soft and smooth to touch. And according to Doctors, touching, skin-to-skin contact can promote my baby's healthy growth and development. Belo Baby helps us to have a skin-to-skin bonding,because we're both have smooth and healthy skin. My Belo Baby moment is my baby Chicay's bath time! We love Belo Baby because it is perfect for very sensitive skin, safe and all natural! BeloBaby turned my baby's bath time around! The hair and body wash is such an amazing product, smells so fresh! We specifically love the face and body lotion because it effectively moisturizes my daughter's skin when it needs it! Never ko pa na try Belo Baby products. But since I read a lot about Belo Baby Im hoping na ma try ko din sya because my little girl has a very sensitive skin. I feel so worried lalo na this summer kasi she easily gets sweat and nagrarashes agad. I hope to win this giveaway. When I first tried the lotion, I got impressed. The price is really worth it. I didn't expect it to be that way and I'm happy with the effects. My kids and I loves belobaby products so much. Sobrang nahiyang sila dito. Hindi malagkit sa skin at sa kamay. Truly recommended sa mga mommies kagaya ko. Worth it ang paggamit nito dahil pinapanatili nitong soft ang skin nila pia at teptep. 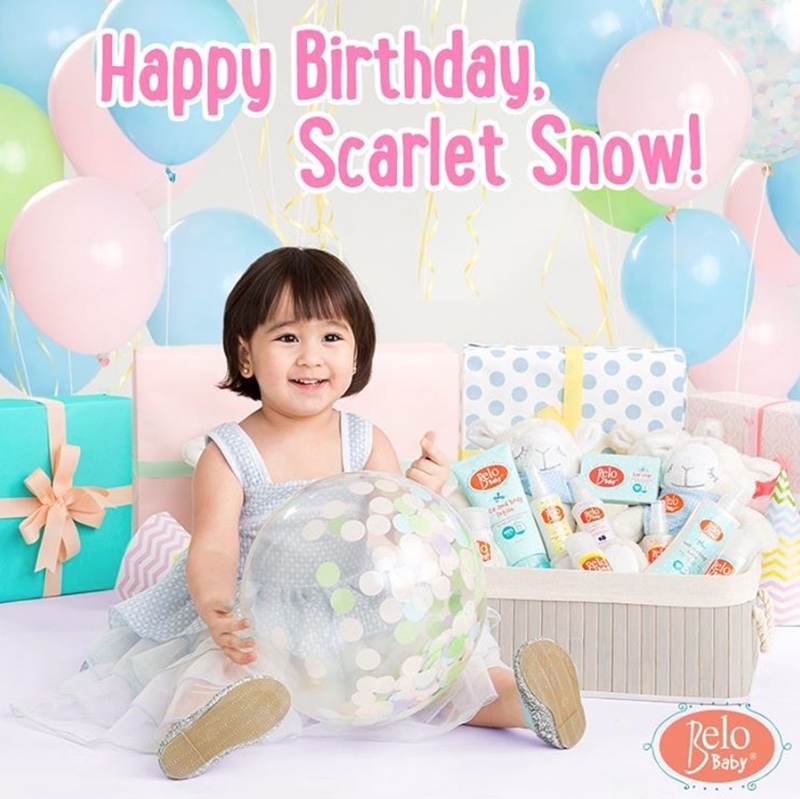 Happy 2nd Birthday @scarletsnowbelo ;) Thank you for being part of our life! We've been using Belo Baby Hair and Body Wash on my 1-year-old son, and it is really gentle on her sensitive skin. Rich in natural cocoa butter, shea butter, and sweet almond oil to nourish and protect her skin, the baby wash is free of harmful chemicals and common allergens. Love the subtle baby scent too! After bath time, I put Belo Baby Face and Body Lotion on son's arms and legs, concentrating on any rough spots. The lotion is light and non-greasy, and just as safe, gentle, and natural as the body wash.
What i also like on Belo Baby products is very affordable,priced at P79.65 for Baby Belo Bar Soap, P219.75 for Belo Baby Hair and Body Wash (P219.75), and P224.75 for Belo Baby Face and Body Lotion. Our Belo baby moment ng anak ko ay tuwing bath time niya. Know why? Kasi pag bath time na niya, Hindi ako nahihirapan paliguan siya kasi andiyan ang Belo baby hair and body wash na hands along tulungan upang mapabilis ang pagligo ng anak ko. Pero Hindi rin, kasi gustong gusto ng anak ko magbabad sa tubig lalo na at may Belo baby product siyang kasama. Kaya subrang love namin ang @belobabylove product. At hindi lang natin namamalayan na mag 1 year na pala ang Belo baby product. 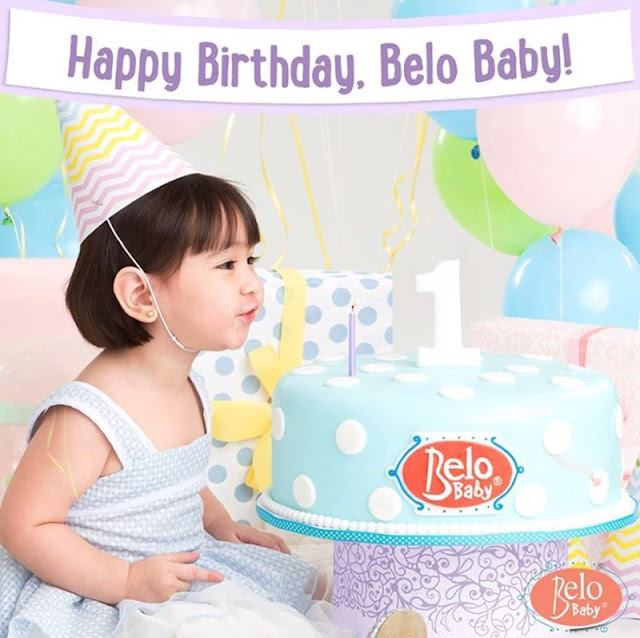 Happy 1st Birthday #BeloBaby!!! Your such an amazing and very satisfying product that is best for children with no side effect and very safe to use. Cheers! For more years Belo baby!!! Hi Miss Rochelle mai share ko lang before lagi kasing nag susugat ang 4 year old son ko mula ulo batok at minsan sa braso pati pwet ng baby ko dahil lagi siyang nangangati hindi niya mapigalang kamutin. I have tried many baby products such as Bodywash pero nung na try ko yung Belo Baby products promise hindi na nagkaroon ulit ng pangangati at sugat sugat ang baby ko kaya nga nag stick na siya sa pag gamit ng Belo Baby Hair and Body Wash. Ayoko na kasing maranasan niya pa ulit yung hirap nung sinusugat pa siya kasi nakakaawa talaga. My favorite is the Belo Baby Face and Body lotion. Aside from being affordable, I love how it keeps my son's skin healthy, soft and moisturized the whole day. The scent is just mild, and it's smell like a new born baby. It is very gentle, perfect for my son's delicate skin. My favorite moments with my daughter, I always put lotion on her skin after to take a bath, I love how it kept her skin moisturized even during these hot summer days. I used it to her daily and it doesnt have any harsh effects on her skin. My daughter likes its scent so much. Every time I applied it on her skin, she smelled and smiled at me. It has a pleasant scent that is not strong or overwhelming at all. 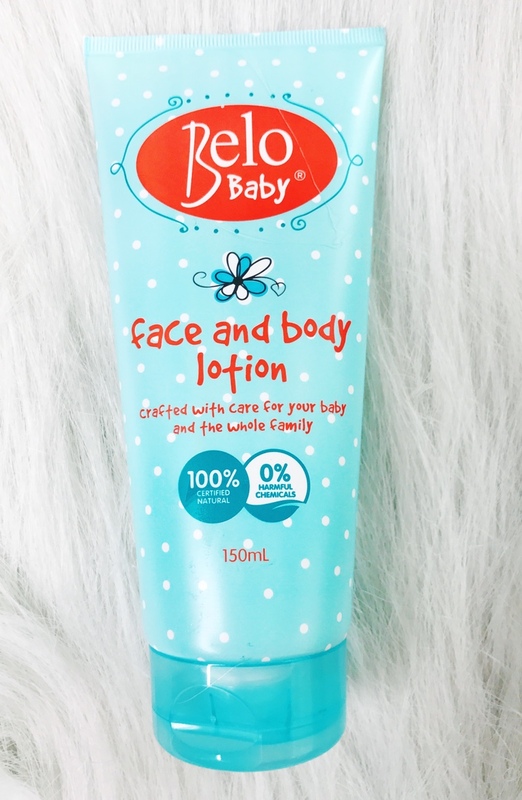 I loved my daughter Belo baby lotion and I use for her daily activities in her school, and so far, it has worked wonders in keeping my daughter's skin soft and smooth. so I can say that it can lasts longer than the other brand. Aside from being affordable though it's a 100% natural product, the cleansing properties is really nice it's very gentle and has a pleasant smell too. 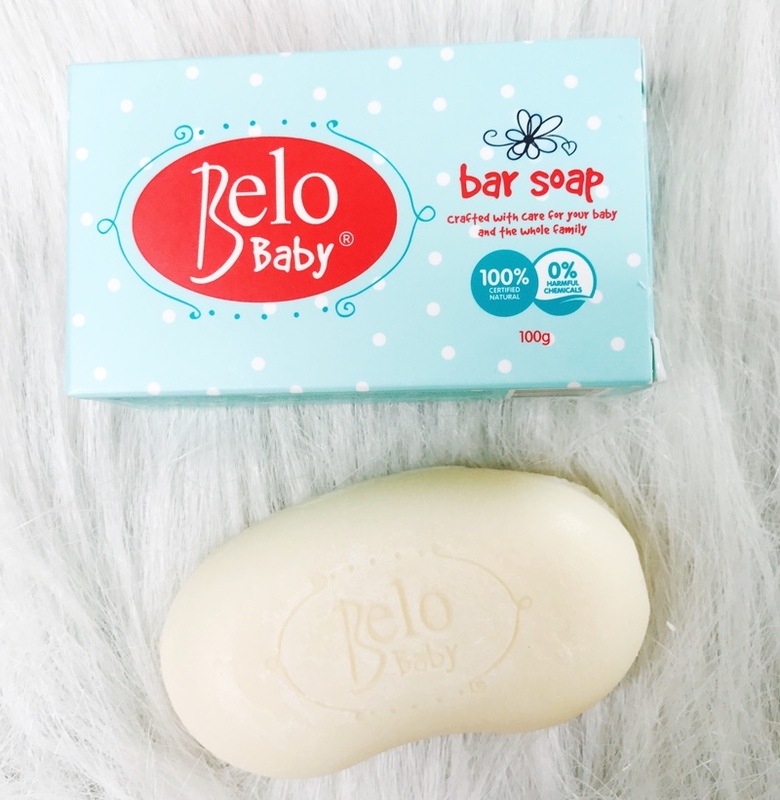 My daughter love using Belo Baby Bar soap because my baby become more active and fresh all day! I don't know if I already leave my comment here but will post again in case I missed it! My Belo Baby moment is my baby Chicay's bath time! We love Belo Baby because they are perfect for very sensitive skin, safe and all natural! Happy 1st Anniversary Belo Baby!!! My daughter is using Belo Baby Products since it was launched last year and since then we did not switched. We love how the hair and body wash lathers gently and smoothly on her hair and skin. Even I is always excited every bath time because we will be using again the safest, the gentlest, and the baby scent products that take good care of our hair and skin. Bath time is our Belo Moment, our special bonding moment because it our time to lather each other and play with the bubbles! I have no worries that our skin will get irritated even if we stay longer in the bath with our dancing and singing with the bubbles and banters because Belo Baby makes us and our head to toe very happy. After taking a bath, we never missed to put on the face and body lotion and it even smoothens our skin too, we are applying lotion to each other. and the Belo Baby cologne to complete our routine. I love the bond the Belo Baby creates with every mom and kid. We love it and we are so thankful because there is a baby product specially crafted for our baby and for the entire family. I love Belo Baby products for my daughter. Ang belo moment talaga namin NG anak Ko is yung kapag naglalagay sya NG lotion then gusto nya ako mag massage, kinakalat nya yung lotion then sasabihin nya mama massage mo Ko.. And I'm so happy kasi nag lolotion sya di kagaya dati.. Thanks to belo kasi 100% panatag ako na safe sya.